Adventures in Indiana: My First Studebaker! 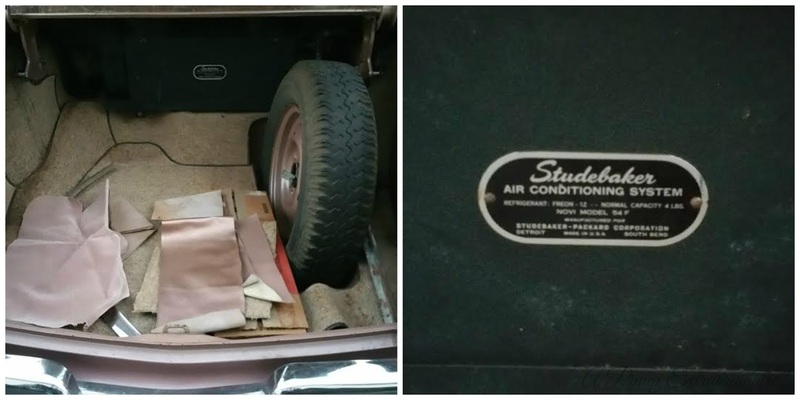 This past Saturday my Studebaker was delivered to the house! James thought I was very calm for such an exciting event but I didn't have a great deal of time to do car stuff as my best friend and her guy were in town for the weekend. Since then I've been racing against the fading daylight (thanks daylight savings! not really) to vacuum out the car. I succeeded yesterday. At this rate it's just an initial vacuuming: removing spider webs, mouse leavings, etc. 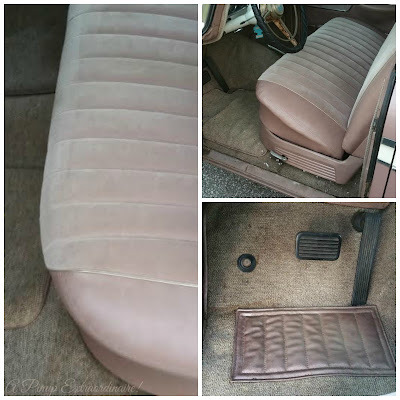 I have a nicely vacuumed car - at least the floorboards. I want to get in between and under the seats more thoroughly. The top right corner photo shows a "before" picture. Some light chewed paper (which I later found the source in the trunk) sprinkled with mice droppings. Not terrible. The nubby material of the carpet really trapped those suckers though. I would vacuum thoroughly, think that I had sucked it all up the vacuum and then I would see a little black piece taunting me buried in the carpet. This is the first wave of vacuuming. 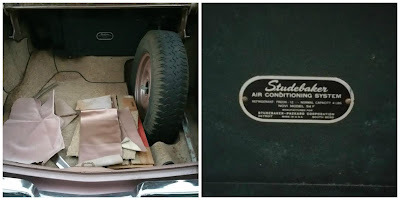 The car has some neat features that are above standard for 1956 such as an air conditioning unit! There are neat cones in the back seat to deliver the cold air and the unit is housed in the trunk. I'm doubtful I'll be using this feature - it makes it harder to access my engine and will use quite a bit of gas. Still, it's really neat! I'm also thrilled that I have extra pieces of interior! The interior of my car is good - some stuff needs to be put back into place but nothing is torn - except my headliner (thanks mice!) which I'm replacing. So I'm thinking it would be awesome to have a kustom purse that matches my car with interior material (both vinyl/Naugahyde and velvet). Well, at least a thought for later on since there's much to be done! We'll see! The winner from last week's giveaway is posted on the widget - head over there to see the winner! Check back Friday for another giveaway!